In a quiet cul-de-sac where the Neighborhood Association regulates everything from lawn height to garden gnomes, no one can control the growing addiction to a new online game. Using a GPSmap, the game allows teenagers to battle zombies in their own neighborhood. But as the line between the game and reality blurs, everyone must ask themselves: which team are you on? This New York premiere will be directed by noted film director, screenwriter and producer, Joel Schumacher and will feature the Bats, the resident acting company at The Flea. The Flea is thrilled to be partnering with State of Play, a company that uses play to build community, as they present Humans vs. Zombies: Neighborhood 3 Edition. This live action game will be played around TriBeCa and around the city in conjunction with the run as a part of The Flea’s continued effort to promote new types of engagement with their audience and community. The production features The Bats: Justin Ahdoot (The Mysteries), Sydney Blaxill (Student Body, The Nomad), Alexandra Curran (Student Body), Eric Folks (JOB, Just Cause), Adam Alexander Hamilton (Student Body), Alex Haynes (The Mysteries), Adelind Horan (The Old Masters), Lindsley Howard (The Mysteries), Kerry Ipema (Restoration Comedy), Olivia Jampol (Cutthroats), Connor Johnston, Hank Lin (Sarah Flood in Salem Mass), Madeline Mahoney, Cristina Pitter (Nectarine EP), and Brendan Sokler. The creative team includes Simon Harding (scenic design), Brian Aldous (lighting design), Jessica Pabst (costume design), Janie Bullard (sound design), Grace Interlichia (assistant costume design), John McKenna (assistant sound design), J. David Brimmer (fight choreography), David Monteagudo (assistant director), Zach Golden (assistant to the director), Abbey Bay (production stage manager), and Kaila Hill (assistant stage manager). JENNIFER HALEY (Playwright) is a playwright whose work delves into ethics in virtual reality and the impact of technology on our human relationships, identity, and desire. She won the 2012 Susan Smith Blackburn Prize, a Los Angeles Ovation Award and Drama Critics Circle Award for her play, The Nether, which premiered at Center Theatre Group and was subsequently produced at The Royal Court Theatre with Headlong in London. 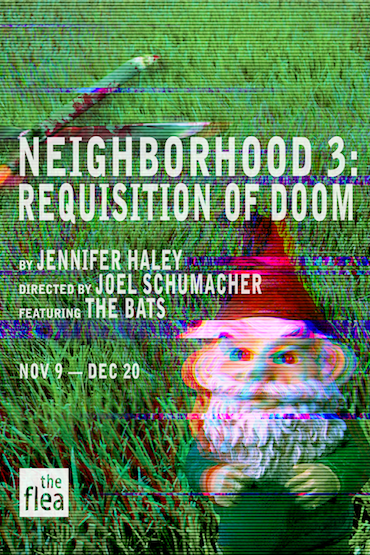 Neighborhood 3: Requisition of Doom premiered at the Actors Theatre of Louisville 2008 Humana Festival, and They Call Her Froggy was produced in development with Center Theatre Group and American Conservatory Theater. Jennifer’s work has been developed at The Banff Centre, the Sundance Theatre Lab, O’Neill National Playwrights Conference, Lark Play Development Center, Ojai Playwrights Conference, PlayPenn, Page 73, and the MacDowell Colony. She is a member of New Dramatists in New York City and lives in Los Angeles, where she founded the Playwrights Union. JOEL SCHUMACHER (Director) is renowned for his versatility, style and ability to move seamlessly between film genres with equal popular success and critical acclaim. He began his film career as a costume designer for such legendary directors as Woody Allen (Sleeper, Interiors) and Herbert Ross (The Last of Sheila), before making his own name as a screenwriter with Sparkle and Car Wash. After cutting his teeth directing two television movies, Joel made his feature film directorial debut on The Incredible Shrinking Woman in 1981. His career soon took off with such iconic fare as St. Elmo’s Fireand The Lost Boys, followed by other successes – Cousins, Flatliners, Dying Young, and Falling Down. He would go on to direct film versions of two best selling novels by John Grisham (The Client and A Time to Kill) as well as two installments of the blockbuster Batman film series, Batman Forever (at the time, the #1 box office opening of all time, with Jim Carrey as ‘The Riddler’) and Batman & Robin. As his career entered the 21st century, Joel brought audiences the films 8MM, Flawless (which he also wrote), Tigerland, Phone Booth, Bad Company, Veronica Guerin, The Number 23, and Trespass. In 2004 he adapted Andrew Lloyd Webber’s hit musical, The Phantom of the Opera, for the screen. The film was nominated for three Academy Awards and a Golden Globe for Best Musical or Comedy. Twelve, based on the groundbreaking novel by Nick McDonell, was honored as the closing night presentation of the 2010 Sundance Film Festival. Since then, Joel returned to television, directing two episodes of the Emmy-nominated Netflix series House of Cards, starring Kevin Spacey and executive produced by David Fincher. Most recently, Joel acted as Executive Producer on Do Not Disturb: Hotel Horrors, a true-crime series for Investigation Discovery.